Phosphate-buffered solution, pH 7.2, 0.09% sodium azide, 50% glycerol. Synthetic peptide from human RPTOR / Raptor. Raptor / Mip1 antibody was raised against synthetic peptide from human RPTOR / Raptor. +4 degree C or -20 degree C, Avoid repeated freezing and thawing. Small volumes of anti-RPTOR antibody vial(s) may occasionally become entrapped in the seal of the product vial during shipment and storage. If necessary, briefly centrifuge the vial on a tabletop centrifuge to dislodge any liquid in the container`s cap. Certain products may require to ship with dry ice and additional dry ice fee may apply. 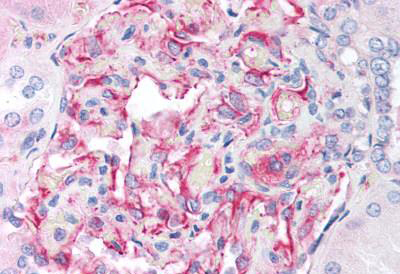 Anti-RPTOR / Raptor antibody IHC of human kidney. Immunohistochemistry of formalin-fixed, paraffin-embedded tissue after heat-induced antigen retrieval. Antibody dilution 1:50. 293T cell extract was resolved by electrophoresis, transferred to nitrocellulose, and probed with rabbit anti-Raptor antibody. Proteins were visualized using a donkey anti-rabbit secondary conjugated to HRP and a chemiluminescence detection system. NCBI/Uniprot data below describe general gene information for RPTOR. It may not necessarily be applicable to this product. 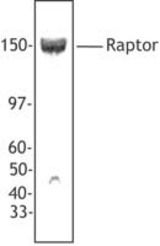 Raptor: Involved in the control of the mammalian target of rapamycin complex 1 (mTORC1) activity which regulates cell growth and survival, and autophagy in response to nutrient and hormonal signals; functions as a scaffold for recruiting mTORC1 substrates. mTORC1 is activated in response to growth factors or amino acids. Growth factor-stimulated mTORC1 activation involves a AKT1- mediated phosphorylation of TSC1-TSC2, which leads to the activation of the RHEB GTPase that potently activates the protein kinase activity of mTORC1. Amino acid-signaling to mTORC1 requires its relocalization to the lysosomes mediated by the Ragulator complex and the Rag GTPases. Activated mTORC1 up-regulates protein synthesis by phosphorylating key regulators of mRNA translation and ribosome synthesis. mTORC1 phosphorylates EIF4EBP1 and releases it from inhibiting the elongation initiation factor 4E (eiF4E). mTORC1 phosphorylates and activates S6K1 at 'Thr-389', which then promotes protein synthesis by phosphorylating PDCD4 and targeting it for degradation. Interacts with MTOR. Part of the mammalian target of rapamycin complex 1 (mTORC1) which contains MTOR, MLST8, RPTOR, AKT1S1/PRAS40 and DEPTOR. mTORC1 binds to and is inhibited by FKBP12-rapamycin. Binds directly to 4EBP1 and RPS6KB1 independently of its association with MTOR. Binds preferentially to poorly or non-phosphorylated forms of EIF4EBP1, and this binding is critical to the ability of MTOR to catalyze phosphorylation. Forms a complex with MTOR under both leucine-rich and -poor conditions. Interacts with ULK1 in a nutrient-dependent manner; the interaction is reduced during starvation. Interacts (when phosphorylated by AMPK) with 14-3-3 protein, leading to inhibit its activity. Highly expressed in skeletal muscle, and in a lesser extent in brain, lung, small intestine, kidney and placenta. Belongs to the WD repeat RAPTOR family. 2 isoforms of the human protein are produced by alternative splicing. 1. suggest no connection of RPTOR variants with psoriasis or its subphenotypes.